Lyndon Charles Pallot, a well loved character known as ‘Don' was born in the parish of Trinity in Jersey and educated at the parish school. He developed an interest in mechanics from an early age and, after leaving school at the age of 14, started remaking bicycles until he became a trainee engineer at Jersey Railways where his enthusiasm for steam was born. In the early 1930's Don opened Central Motor Works at Sion, Trinity, the agricultural works which was to become so well known throughout the Island. He was a brilliant engineer who loved solving mechanical problems and his ingenuity led him to invent several implements which were to make the life of the Jersey farmers easier. The Pallot Elevator Digger, Last Furrow Reversible Plough, Single Furrow Reversible Plough, Tractor Mounted Côtil Winch and Tractor Mounted 2 Point Linkage Transport Box can be seen in the Museum today. His ability to improvise proved invaluable during the difficult years of the Occupation of Jersey by the Germans. It was at his home at Sion that Don raised his large family of 6 sons and 5 daughters with his devoted wife of 62 years “Dolly”. It was in Dolly's honour that the Ransomes, Simms & Jefferies traction engine was so named “Dolly May”. 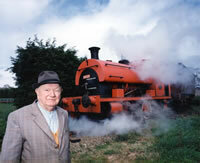 A man of great vision, Don started collecting what he could of our mechanical heritage, with his ambition being realised in 1990 with the opening of the Pallot Steam Museum . There is no doubt that but his steady interest, maintained over many years, much that is on view today would have been lost forever. Locomotives were brought in from the Mainland, Belgium and Alderney and lovingly restored to form part of his vast and varied collection. Sadly, Don passed away at the age of 85, but his memory lives on in his Museum which his family have the privilege to continue to operate.